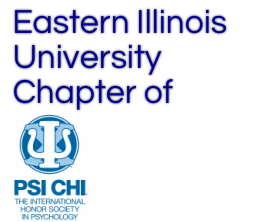 Membership in Psi Chi is open to those who are making the study of psychology one of their major interests and who are students or faculty members at Eastern Illinois University. Both undergraduate and graduate students who have registered for major or minor standing in psychology or for a program psychological in nature may be eligible for membership if other requirements are fulfilled. Have 10 faculty sign the Faculty Signatures Page on the Application Form. The purpose of this essay is for you to tell the members of Psi Chi about yourself, your interests and goals in psychology, activities in which you are involved, and how your membership will benefit the organization. Include a check, made payable to Psi Chi, for $65. Psi Chi Inductions are planned for Wednesday, February 17, 2016 at 6:00 PM in room #2120, Physical Sciences Bldg. Applicants who are accepted will be notified by e-mail at least one week prior to the formal Induction Ceremony. Please plan to dress “business-casual” as this is a special occasion.